KT British Labs Is Your Pet’s Rabies Vaccination Up to Date? Is Your Pet’s Rabies Vaccination Up to Date? 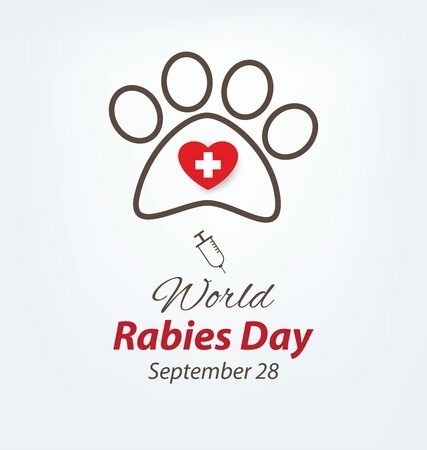 World Rabies Day is tomorrow – Sept. 28. We’ve all heard the word rabies, and for pet owners, it’s one of the scariest words you can hear. At KT British Labs, we believe that a healthy pet is a happy pet, and in recognition of World Rabies Day want to review some facts about this disease and tips to keep your four-legged friend disease free. According to the American Veterinary Medical Association, 2014 saw more than 6,000 cases of rabies reported in the United States. Here in America, one to two people die from rabies infection every year, but worldwide, more than 55,000 people die from rabies annually. H ow can you identify rabies in an animal? To start, your companion’s personality could change. A nice, friendly animal could become very crabby suddenly, or a high-energy animal could become extremely docile and lethargic. Another sign is a fever or chewing at the infected site. The more rabies progresses, the worse it gets. Your animal will become sensitive to light, touch and sound. The more common symptom of rabies, foaming at the mouth, will appear at the second stage. This is caused by paralysis of the throat and jaw. Eventually, the animal in question will become disoriented, have a loss of appetite, and experience seizures. Once the most serious clinical symptoms have manifested, the disease is always fatal, says the Global Alliance for Rabies Control. Any mammal can transmit the rabies virus. Common animals that carry the rabies virus include farm animals (cows, horses, goats), pets (dogs, cats, ferrets) and wild animals (such as bats, foxes, wolves, coyotes, raccoons, woodchucks, skunks, etc.). Statistically speaking, more animal rabies cases are derived from wild or feral animals – usually cats or dogs. To prevent the spread of rabies, it is important to make sure that your pets are up to date on their shots – especially the rabies vaccine. The vaccine can prevent your pet from becoming infected, even if they come into contact with a wild animal acting strangely. If you see an animal that is behaving oddly, such as a nighttime animal out in broad daylight, make sure to keep away from it – it’s better to be safe rather than sorry! By making sure that you and your pets are fully vaccinated and avoiding exposure to unhealthy wild animals, you can help to stop the spread of this disease. At KT British Labs, we offer healthy, purebred dogs that are beautiful animals, whether as a loyal family pet or a great hunting canine. It’s especially important to keep your pet vaccines up to date to ensure the health of your pup for many years to come. To learn more about our puppies or other available dogs, call us today at 218-685-5103.